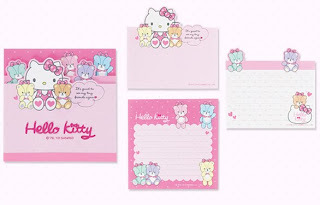 Japan is coming out with a new Hello Kitty series that is called, " Hello Kitty and Tiny Chum." Surprisingly, what is interesting about this new series design is that they have my favorite old vintage bear! And, it also appears that Hello Kitty has the shape of the old vintage 1970's form of face. I would love to L-O-V-E this new Hello Kitty series, but once again I think this series has won the *almost-had-it* award. This gets my stamp of "keep at it" stamp of approval. The whole design overall scheme looks good except for one small detail. That detail would be too many bears overcrowding Hello Kitty. On certain products, Hello Kitty looks squished or basically has no arms. I can understand the concept with having a lot of bears, but couldn't Sanrio have Hello Kitty and her tiny chum bears positioned better so it would look better? I guess I'm just not as impressed yet. Notice I said yet. There's hope for you, Sanrio. ^ Usually, I wouldn't recommend anything not related to Hello Kitty or a Sanrio character, but this Tiny Chum bear is too cute to pass up! Look at that polka dot bow accessory on top! You can view all items here. OMG where can i buy the bear?!?!? !